I wanted to take this time to honor my grandfather, Richard Morgan DeCrastos. He was a brilliant writer, disciplinarian, theologian and scholar. Below is a letter that he wrote as a middle-aged man…an illustration….. I really don’t know how to write this letter to you. I don’t know if I can even say what I want to say in an understandable way. I even had trouble with this heading. By chance, I was born into the United States of America. I was raised, in love, by my parents. I was educated, with concern, in the public schools and through a private Church-related college. Now I am middle-aged, married, and the father of two teen-aged children. As far as I know, I am in good health. To this time we have not had a major illness in our immediate family and few minor ones. I am employed at a salary which permits me to live with all the necessities and all the comforts I need. In seeking gratification of the five senses you created in me, I have been more than successful. My eyes have seen love in the faces of those dear to me; they have thrilled to the natural beauty of your world; they have marveled at a man’s created arts; they have filled with tears at moments of joy. I have touched, and been touched, many times by those I love and the things I love. And it is equally true of my senses of smell and hearing, and of tasting. These are all so closely related that what is true for one is almost always true for the others. Thus, you easily see that I really don’t lack anything in the way of physical desires. But what of the Spirit? Here again, I consider myself most fortunate. I have a church I believe to be inspired and led by You. Certainly our Pastors and Ministers show every evidence of deep, sincere devotion to Christian precepts. I hold, and have held for some years, different positions of leadership in my church and have been blessed time and time again. More friendships than I can count, more fellowship than I can remember have been my measure. The Apostle Paul said in I Timothy that there is great gain in Godliness with contentment. If that is true, than I have made a great gain because I am content. Truly, my cup runs over. I only hope that, in my contentment, I will not be complacent. They are not compatible. Well, there it is – most of it – said in a very poor fashion. Oh, I know many people have more money, bigger cars, finer clothes, and fancier homes than I do. But – are they as rich? Perhaps I interpret your scripture wrong. 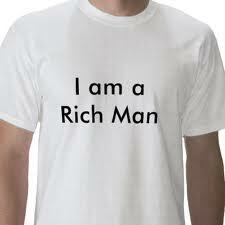 My description of a rich man may be different from yours as depicted in the Bible. I hope so because there are so many of us rich folks. We maye just don’t know it. I hope we are not all excluded! I have been praying about this very thought concerning myself and the church I Pastor. We are very rich. With riches comes self- sufficiency and self – rule etc. Thanks for pasting this letter, It says it all very well. How wonderfully sincere and thoughtful your grandfather was. I agree with him whole heartedly!